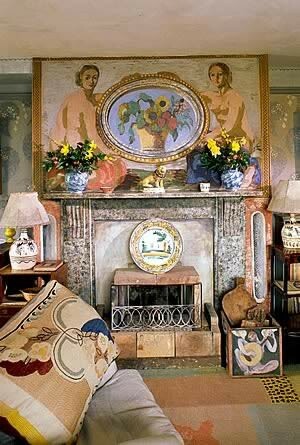 One of my longtime favorite art/home deco inspiration sources has been the art and craft of the Bloomsbury group, Charleston Farmhouse, and the Omega Workshops. I love the aesthetic–the rich yet muted palette of colors–and also the idea of living surrounded by art on all sides, where each component of one’s familiar space is also a work of art. It’s something I’ve long aspired to in my own home (handmade pottery, painted surfaces, etc.) and now, clearly, touching my wardrobe as well. 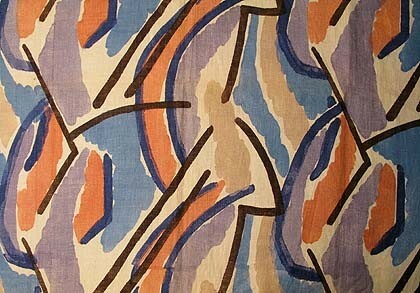 Lately I’ve been returning to this inspiration again, thinking of fabric design. 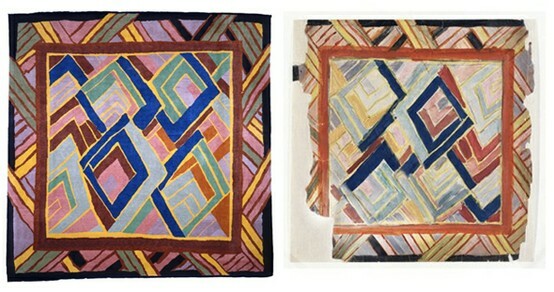 The Omega workshops translated many of their paintings into textiles for both home use and fashion, many of the participants wore clothing of their own design, with their own fabric patterns as well. 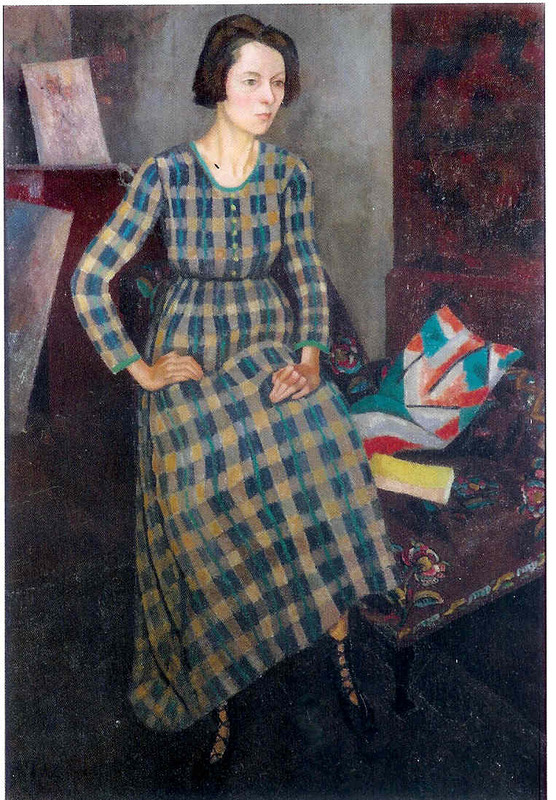 I recognize this print from my own library as a very close copy of one designed by Vanessa Bell–and they’ve paired it, so cleverly, with Nina Hamnett plaid stockings. -Nina in her delightful kiss-and-tell autobiography, Laughing Torso. 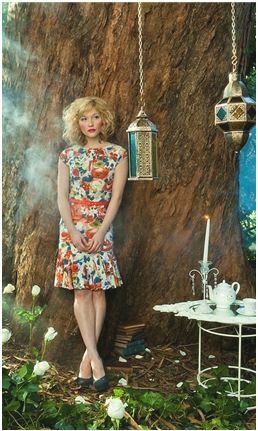 At any rate, I’m brewing Bloomsbury-style fashion inspirations. Whether these will be ideas that come to fruition in some future project, or whether they stay in the brew pot of unreachable crafting aspirations, only time will tell. 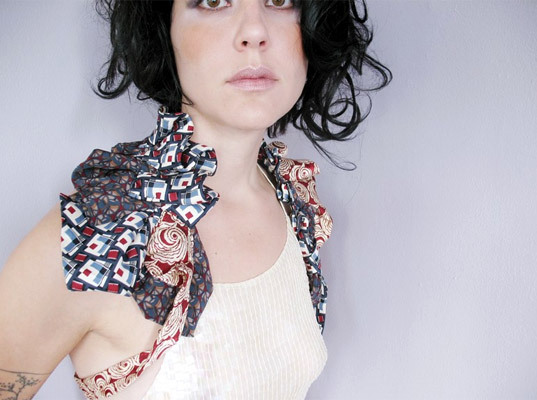 One other “Maker of Fine Clothing” that I admire is textile artist Leni Hoch. 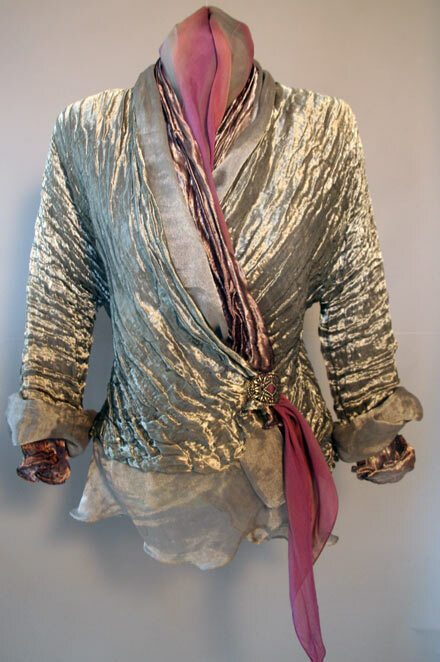 Leni Hoch makes silk scarves (mostly) but also jackets that start with a very light, transparent fabric, and then are hand-dyed lustrous and brilliant colors, often with a metallic sheen. Then they are intricately pleated. 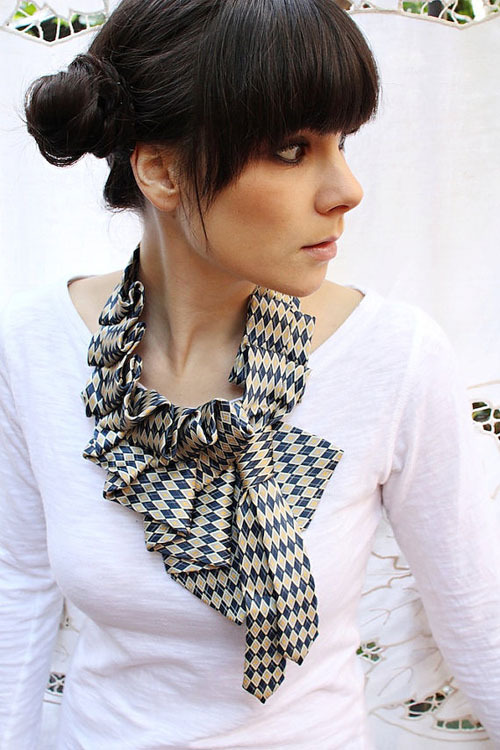 The resulting scarves have more body and form to them, from the scrunched pleats. As you’ve seen, the cloth-as-sculpture thing is a perennial favorite for me. With a fabric this distinctive, the shapes and styles of a garment can be really simple, as the fabric takes over and makes any resulting item a statement piece that’s hard to imitate. Complex, intensive process leads to strong, distinctive and unmistakable results. My hands-down favorite clothing vendor at the ACC show was Teresa Maria Widuch. Widuch makes jackets in wool felt and ultrasuede: simple, sculptural jackets with crisply cut raw edges of fabric stiff enough to stand up like paper. Indeed, at first glance one might have thought the booth held paper cut-outs of clothing. The colors were pure and vivid: fuchsia and citron, smooth, even colors that let the shapes stand out and highlighted the three-dimensional forms by emphasizing the cast shadows across the surfaces. 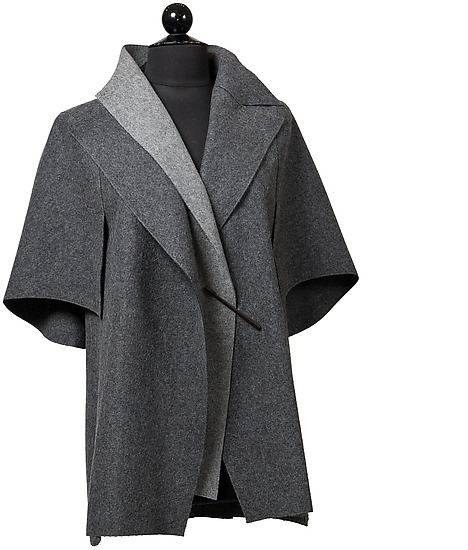 They look, at first glance, deceptively simple: a raglan sleeve here, a rounded collar there. But this is yet another instance where a “simple” look comes from a myriad of perfect details, all lined up to deceive the eye into reading the whole, “simplicity”, rather than each of the details on their own. I’ve never seen anything like these. I’ve never seen anything constructed quite like them, either–the pieces are put together like sculpture, not like clothing. And there are no two alike. I don’t know how many I looked at (nearly every one there, I think) and each one offered a slightly different shape or variation from all the others. Some (like the red example, above) had an inner part that serves like a vest, under the opened petals of lapels. 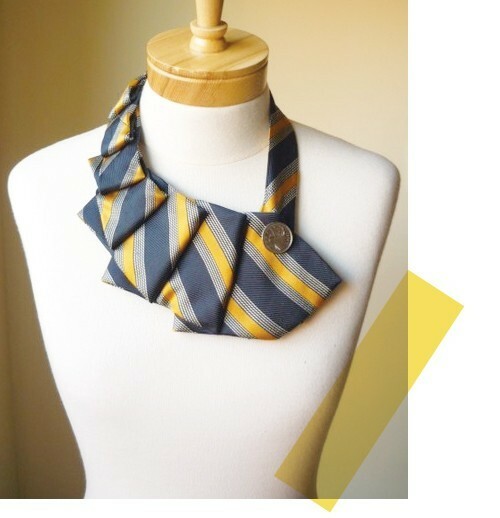 Many had asymmetrical collar lapels, wrapping differently on the left than on the right. Some had decorative design details cut out, some had toggles or closures and others just fall open smoothly. 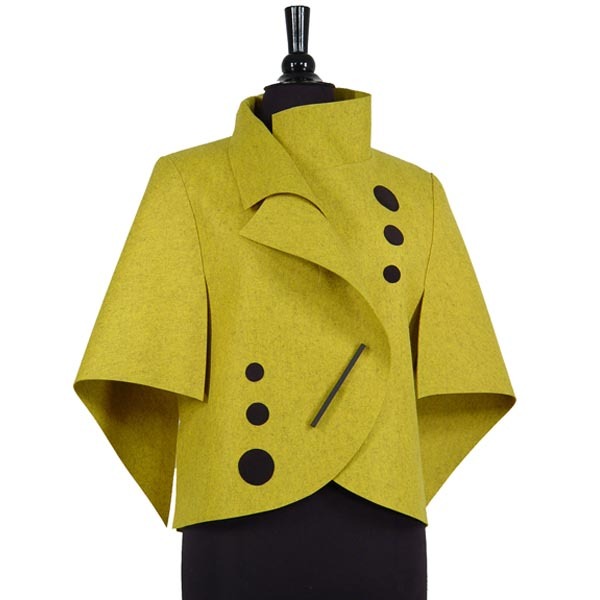 All of them are based on traditional jacket forms–blazer, kimono, cape, etc., but none is quite straightforward. This is a great example of how, crafty and clever as I might think I could be, I know that I could not duplicate this effect in my own workroom, for any amount of trying, at least not without spending far more for materials and effort than the finished jackets themselves cost. (You see, I’ve tried ultrasuede!) And I think it’s because I sew, myself, that I appreciate this all the more. Because I know where the seams usually go, on a blazer or jacket, that I notice how the traditional seams are moved or missing, and all the different variations Widuch has made to design a garment that looks like and yet nothing like what we expect from a jacket. There’s something almost existential about these that I love. They’re sculptures: art pieces that comment on the “essence of jackets”, perhaps. 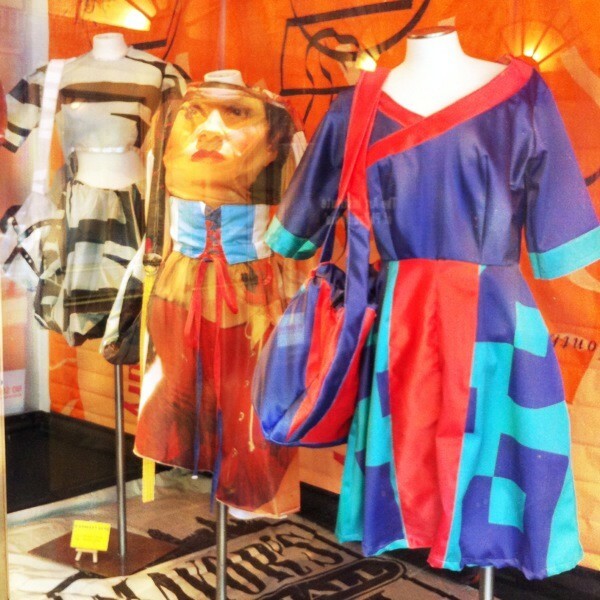 Sculptures about clothing that double as actual, wearable clothing. And they’re quite chic when worn, as well: they have their own dimensionality and stand out and away from the body, and yet their shapes are as conscious of the shapes of human bodies that fill jackets as they are about jackets, and thanks to carefully angled darts and seams they look quite gracious when modeled. 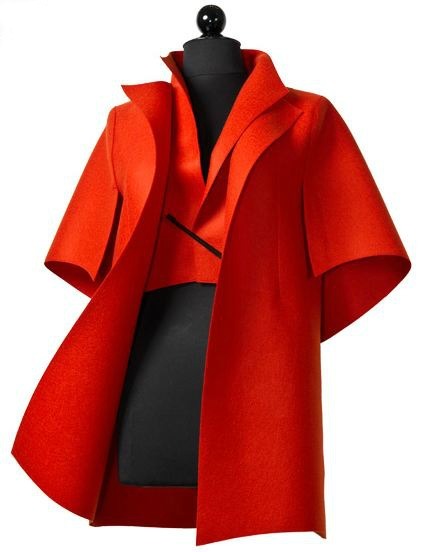 One day, perhaps, when I return to buying clothing that other people have made, I may find that it takes something this dramatic, this chic to make it worth my while to go shopping. And wouldn’t this be a handsome acquisition, to a handmade wardrobe?